How SMART Goals help determine what should be categorized as a goal. I really don’t like the word “resolution” – and I never set any New Year’s Resolutions for myself. The way I see it, if there is something I need to change about myself, I’m not going to wait until January 1st to make that change … I’d better get on with it right away! If you realize you’re eating too much cake, or that cigarettes cause cancer, you should make those changes immediately. New Year’s Resolutions just don’t seem to stick. The unfortunate truth is that it’s become completely normal and accepted to flake out on our New Year’s Resolutions – the gym is packed to the gills in January, a little less crowded in February, and then back to only the regulars in March. However, I do see the value in setting goals. Goals have a different feel than resolutions do. Resolutions have a negative connotation, don’t they? New Year’s Resolutions usually mean that you need to stop doing something you shouldn’t be doing. I resolve to quit smoking! I resolve to lose weight! I resolve to stop spending so much money! Raising my children to be healthy, productive adults. 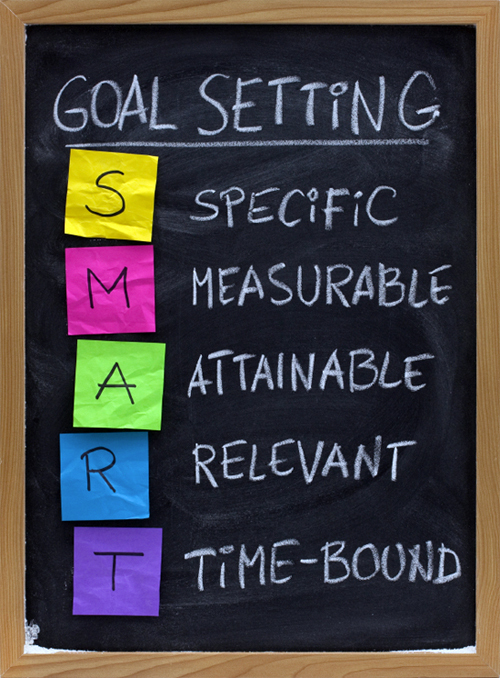 I recently learned about SMART Goals; I use them to help me determine what should be categorized as a goal. You may think you have a goal, but what you really have is a dream, or even a task. SMART Goals force you to think about the content of your goals. Instead of having a goal like, “I’m going to become rich!” you need to make sure you’re able to achieve a very specific goal within a determined time frame. This is a great illustration of a SMART goal – it’s relevant to the student’s assignment, it’s definitely achievable, and it’s time-based because the student has a deadline for the project. Teens can apply the principles that make up the SMART Goals to various aspects of their lives – and to planning their future. Your teen might be more of a worker than an athlete or someone who participates in extra-curricular activities. That’s ok – everyone has different strengths and interests. If your teen works part-time at the local movie theater or grocery store, make sure s/he has the goal of budgeting. Here’s a good guideline: “From each paycheck, I will put 50% into savings, and I will NOT touch it. That’s specifically to pay for a car (or college, etc. )” This is a wonderfully specific goal that is measurable and achievable. While it may not exactly be “time-based” you and your teen can determine the amount of money you think is reasonable to spend on a first car. HINT: If you want to help fund a car, offer to match the amount of money that your teen saves! Many teens are involved in extra-curricular activities such as band or scouting. Our older scouts are working on Eagle projects, or Silver and Gold projects, which can become pretty overwhelming. These are big projects that take a lot of time and planning. The SMART Goals are perfect for planning an Eagle project. Your teens need to make sure they understand the demands of the project they choose. They also need to be able to track their progress as they do their work, and have a definite end-date. “For my Eagle project, I’m going to transform a vacant lot into a park that members of the community can enjoy. I will need to raise $2,000, ask for plant and flower donations, and recruit a team of volunteers. This will be an eight-week project.” While this is a big project, with the proper planning, hard work and time management, it’s completely achievable. When working with your teens on implementing SMART Goals, start slowly: they don’t need to apply them to every part of their life immediately. If they begin setting goals and sticking to them when they’re young, they’ll have a great head start for their adult life! To learn more about Diane O’Neill, visit her at http://www.youwontlearnthisinschool.com/.